When I see a Western brand making a BB Cream, I admit I raise an eyebrow and doubt that it is little more than a tinted moisturizer. 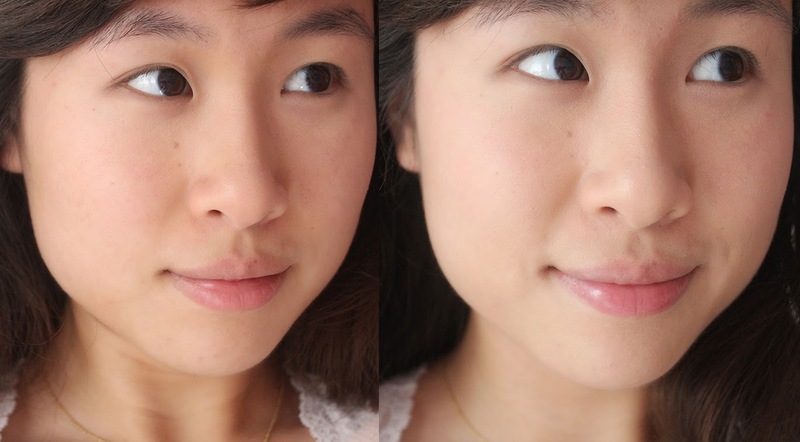 But I still have a soft spot for a good base, whether it be BB Cream, foundation or tinted moisturizer. 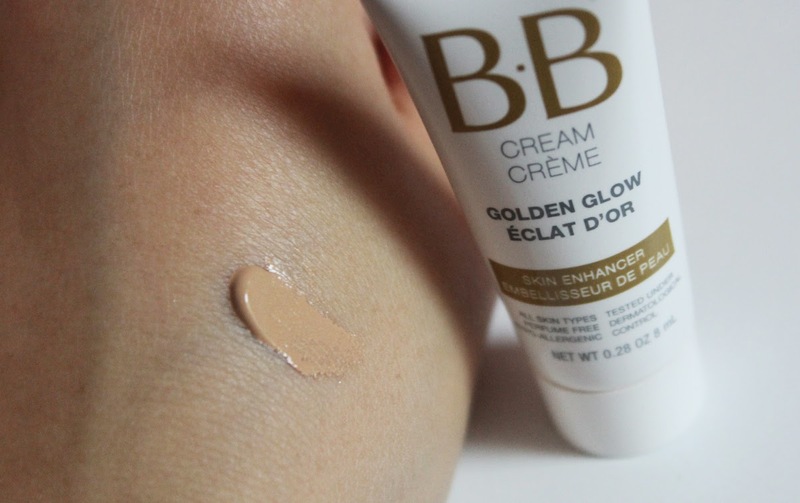 Marcelle, a Chicago-turned-Canada based beauty brand, offers two kinds of BB Creams, a normal one which comes in a few shades and the Golden Glow variety which is a single shade of light bronze goodness. Although the BB marketing on this is a bit gimmicky, it's still a fantastic base which I have been enjoying a lot lately. I got a 8 ml sample tube from Birchbox where you can purchase the full size for $27 for a 47 ml tube. 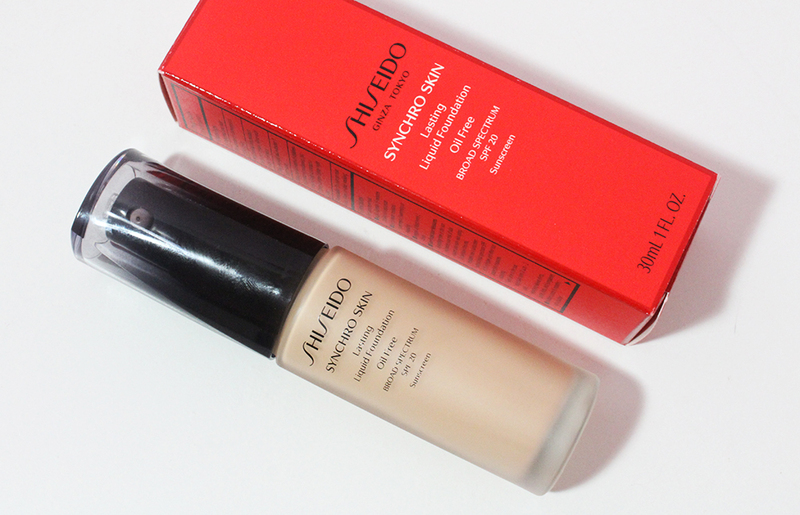 This is a bit less expensive than high end foundations and the tube contains more product than the typical 30 ml. 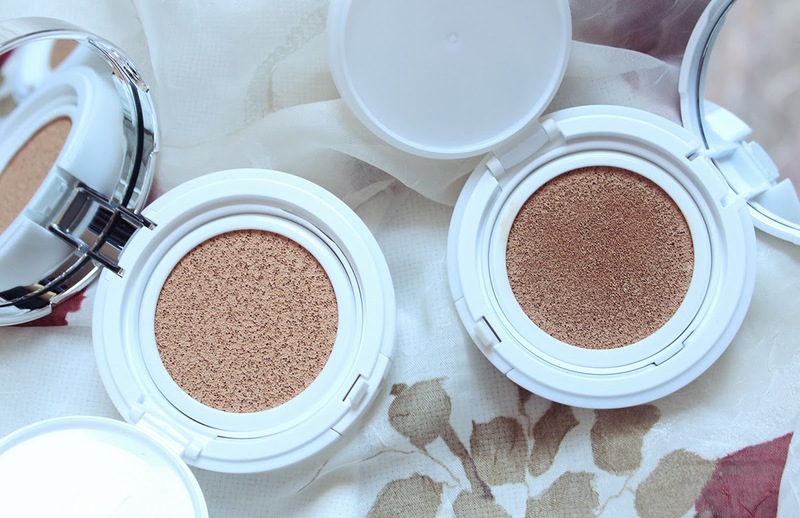 I only need a tiny pea sized dollop to do my whole face so a little goes a long way. The shade is a tan beige that melds into my skin very well. There is a slight shimmer in the formulation which only appears under strong lighting. For the most part, the sparkle is undetectable on my face which is a good thing. I like to dot the cream all over my skin and use a buffing brush to spread out the product evenly. You can also use your fingers to apply which is convenient. 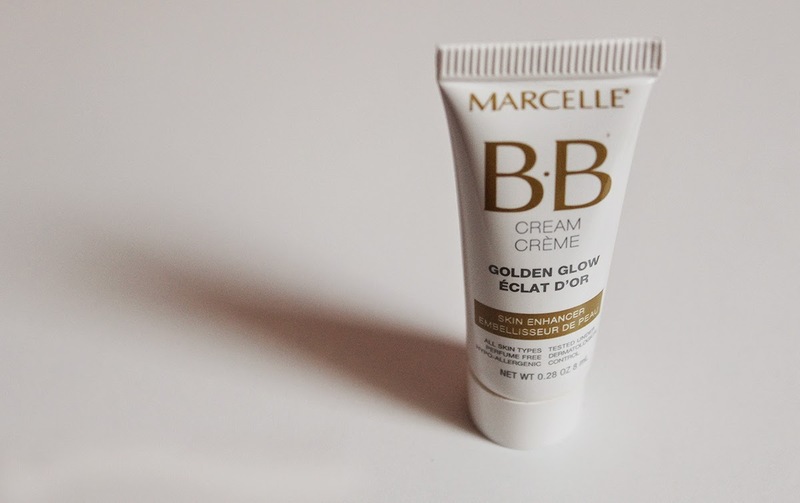 The effect of Marcelle's Golden Glow BB Cream is subtle but noticeable. On the left I have on a clear primer and under eye concealer. 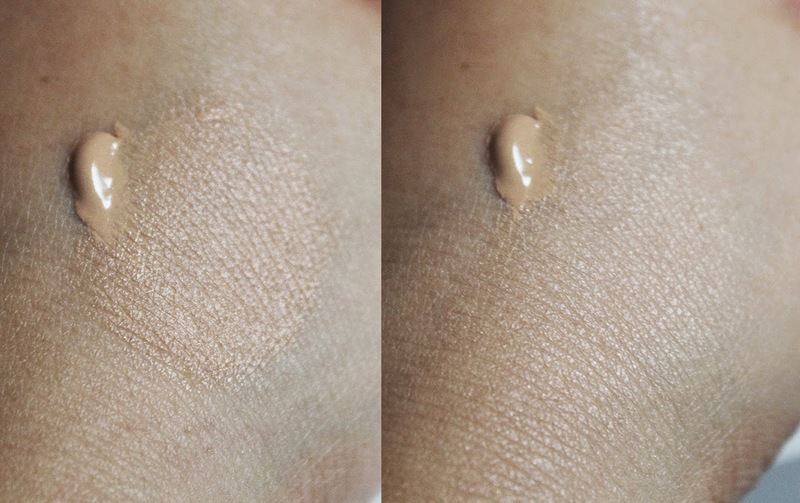 On the right is a freshly applied layer of the Golden Glow BB Cream. You can always open my before and after photos in a new window to see my skin imperfections up close! I also do not retouch before and after photos for a fair comparison. Redness on my cheeks and around my nose is minimized and my complexion is more luminous and fresh. 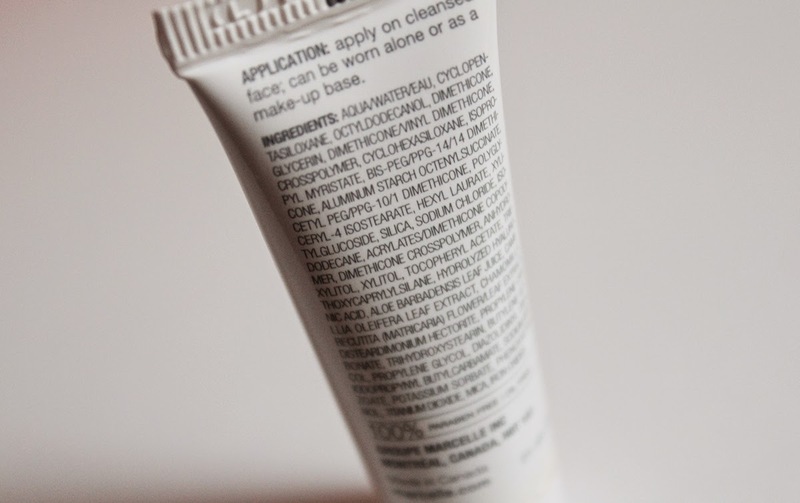 The lasting power of this is great; with primer and powder, my makeup stays looking like I just applied it for 10 hours. Here is a shot of the ingredients list for those who might be curious. Marcelle touts this as an 8-in-1 cream which not only evens out skintone and gives you a glow but also promotes skin regeneration, evens out skin tone and prevents premature aging. I don't see how this product can deliver on skincare claims because many of the ingredients are not skincare related. There is a low concentration of aloe which may be soothing but I think you would need to apply quite a bit to notice the effects. I am curious as to why this does not include sunscreen because that would be a factor in preventing premature aging. On the bright side, this is 100% paraben free, gluten free, fragrance free and non comedogenic. Inflated claims aside, I really like how the Marcelle Golden Glow BB Cream looks on my skin and think it's a great summer staple for those whose skintone can pull this off. I also have a full size tube of the regular Marcelle BB Cream which I have yet to try out but I'm hoping I like it as much as this version. I am very excited that Marcelle is sold through Birchbox now because I have been curious to try their products for awhile. Have you tried any Marcelle products before?